Today my CSA partner in crime, Brandy, is taking over and talking tofu. Stop. Don’t run away just because I said tofu. 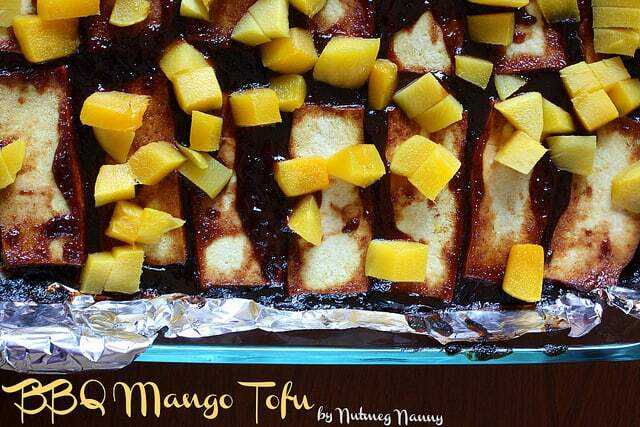 Look at that picture below and tell me you don’t want to dive into that bbq mango abyss. It’s tempting me and I’m in the midst of a gelato and pasta free for all over here. And if you are tempted by the horrific made up oreo concoction she mentions below, (which I think is hysterical & disturbing at the same time) 1. I have no idea why you’re on this site and 2. please do the world a favor and resist the urge to make it. The asses of America thank you in advance. So, thank you to Brandy and thank you to Averie for the recipe inspiration today. Enjoy, guys! I should admit that tofu is not something that makes a usual appearance in my house. We are meat and potato people. However, I knew I had to give this recipe a try after I saw it posted on Averie Cooks. I saw the sticky glaze and sweet mango and all I could think of was “I want to go to there.” Yes. I had a Liz Lemon moment. After I brought home my tofu I stared it for a few minutes and finally called my little vegan brother to help me out. He recommended freezing the tofu overnight, letting it thaw the next day and then draining. Apparently letting the tofu freeze before cooking creates a better texture. Now, after the draining process was complete I sliced it as evenly as possible and poured on the sauce. 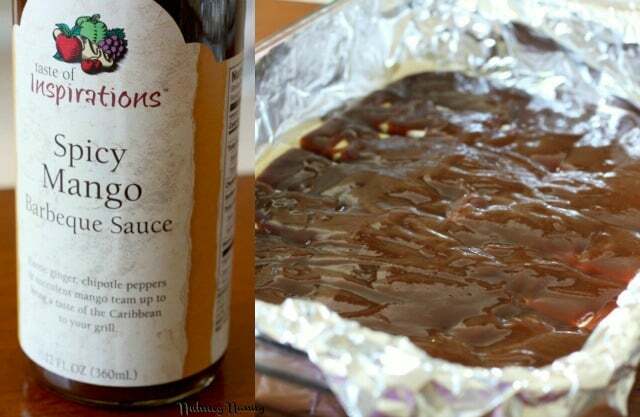 I used a spicy mango bbq sauce but you could use just about anything that tickles your fancy. Regular bbq sauce, korean bbq sauce…it all works! I let my tofu marinate for a few hours and then popped it under the broiler. In a few short minutes I was eating a delicious lunch. Go me! A sweet BBQ approach to tofu that will convert even the biggest skeptic. This is a simple and easy vegetarian dinner everyone will love! 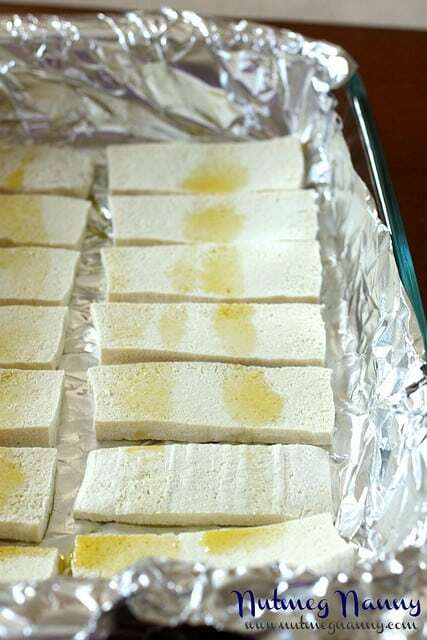 Freeze tofu overnight. Let thaw in sink and once thawed starting the draining process. Drain the lose water from the package and wrap the tofu in three paper towels. You want to make sure it's wrapped up like a little tofu gift. Put on a plate and top with a small cutting board and heavy book (or cans, weights, etc.) You want to push down on the tofu to drain the water but careful not to squish the tofu. Put in the refrigerator and let drain for at least an hour but overnight is best. Once drained, slice evenly and lay out in foil lined 9x13 glass dish. Drizzle with olive oil and top with bbq sauce of choice. Let sit on the counter for about an hour to help the flavor marinade into the tofu. Put your broiler on high and cook for about 10 minutes. Flip tofu and cook for about 5 minutes on the other side. 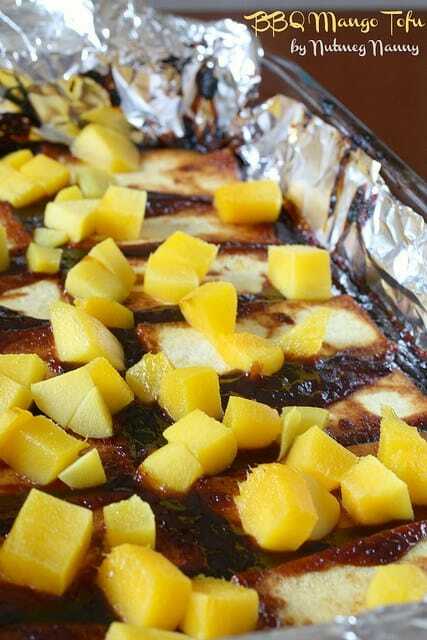 Once it's browned on the edges take it out of the oven, top with mango, let it rest for a few minutes and enjoy! I have never had tofu, but you make me want to buy some! Your recipe looks delicious!!! I actually love tofu (and I’m a meat eater). I think people who don’t like it have either never had it OR have never made it properly. This looks great! I’m glad you both like my recipe. Hope you’re having a great time in Italy, Gina! This looks delish!! I love tofu, but have never made it this way. Definitely trying. I’ve never been big on tofu, but both times I’ve seen this recipe I’ve caught myself drooling! I actually love tofu – in Asian type preparations – and this looks incredible! Good job Brandy! I love tofu! This looks great. Nice work Brandy! Looks good! I love mangoes and I use tofu fairly often, so this one’s an easy sell for me. I only press tofu sometimes and I have only frozen it a couple of times though I wouldn’t mind experimenting with freezing it more. Usually I just buy extra firm which is already a lot like pressed tofu.